Ivan And Alyosha On Mountain Stage The Seattle indie-pop band brings the Beatles-esque harmonies and infectious guitar hooks of their second EP, Fathers Be Kind, to West Virginia's most famous stage. Ivan & Alyosha performed on Mountain Stage. "I Was Born to Love Her"
The young Seattle indie-pop group Ivan & Alyosha took its name not from members of the band, but from the seminal characters in Dostoyevsky's The Brothers Karamazov. Tim Wilson and Ryan Carbary are joined by Tim's brother Pete Wilson on bass, Jesse Carmichael on drums and Tim Kim on electric guitar. The band's first recording, a seven-song EP called The Verse, The Chorus was released in 2009, and garnered attention here on All Songs Considered, as well as a glowing review of "Easy to Love" as a Song Of The Day. Ivan & Alyosha's second EP, Fathers Be Kind, was released in early 2011. 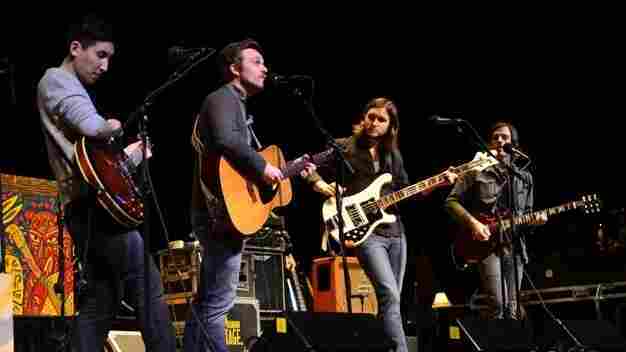 Beatles-esque harmonies and infectious guitar hooks abound in the group's four-song Mountain Stage set, which includes three tunes from Fathers Be Kind, as well as "Easy to Love." This segment originally aired on April, 21st, 2011.